If you’re in the market for new bathroom lights, come on down to our Shelby Township lighting showroom. We specialize in offering full room design solutions and our modern bathroom lighting selection is sure to please. Come down to our showroom and see our decorative, yet highly functional, selection of vanity lights, flush mounts, semi-flush mounts, and more. We even offer exhaust fans if you want to really change up your look. When you’re looking to have a modern bathroom that’s sure to be one of the most relaxing, perfectly-lit rooms in your home, there’s no better resource than Shelby Design Center. Contact us to schedule a consultation today. There are three types of layered lighting to get the optimal bathroom lighting: ambient lighting, task lighting, and accent lighting. The right combination of these three are sure make your modern bathroom look good as well as be fully functional. Use natural lighting to your advantage. 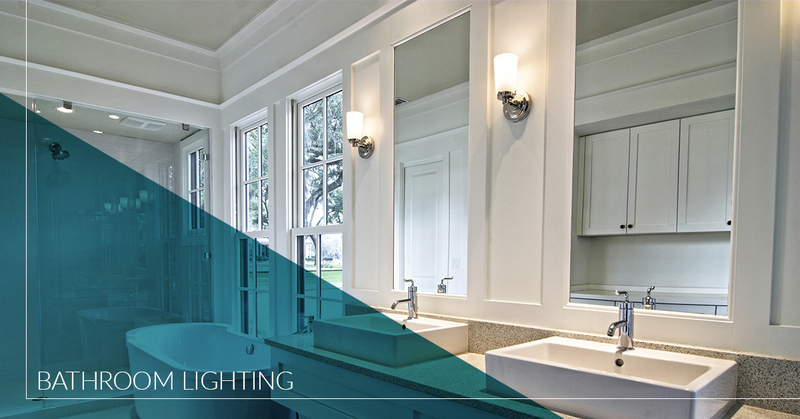 See how the light enters your bathroom windows and hits the walls. Then consider how you need to light your bathroom when the natural light isn’t there. Ceiling lighting in your bathroom should be the first thing you focus on. This will provide both the lighting you need and set the tone for every other fixture you choose. 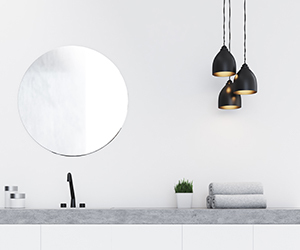 If you’re using a double sink vanity, use the same light fixture above both sinks. You could also use a large one that spans both. This ensures uniformity of lighting as well as aesthetics. Use wall lights and over the mirror lights to get the best lighting from all angles. When it comes to modern bathroom lighting design, you won’t find anything better than our lighting showroom in Shelby Township. 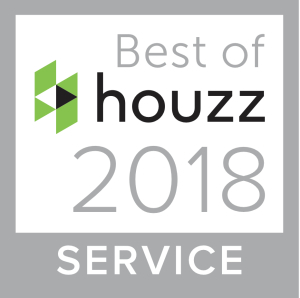 Our experienced design consultants are here to help you navigate the waters and select the best possible lighting solutions to make your bathroom functional and beautiful. All the while meeting your budgetary requirements. We understand your bathroom can be a haven from the outside world. We want to make it the most relaxing, comfortable, and most of all, well-lit it can be. So stop by our lighting showroom today and see how we can help. And to compliment your new bathroom lighting, please take a look at our bathroom flooring options as well.